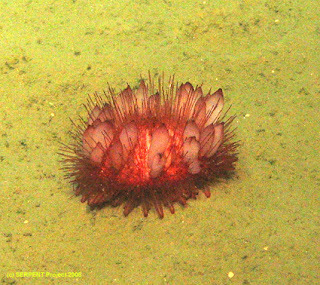 The Echinoblog: New "Tam O Shanter" urchins (aka the Echinothurioids!) from Deep-Sea New Zealand! New "Tam O Shanter" urchins (aka the Echinothurioids!) 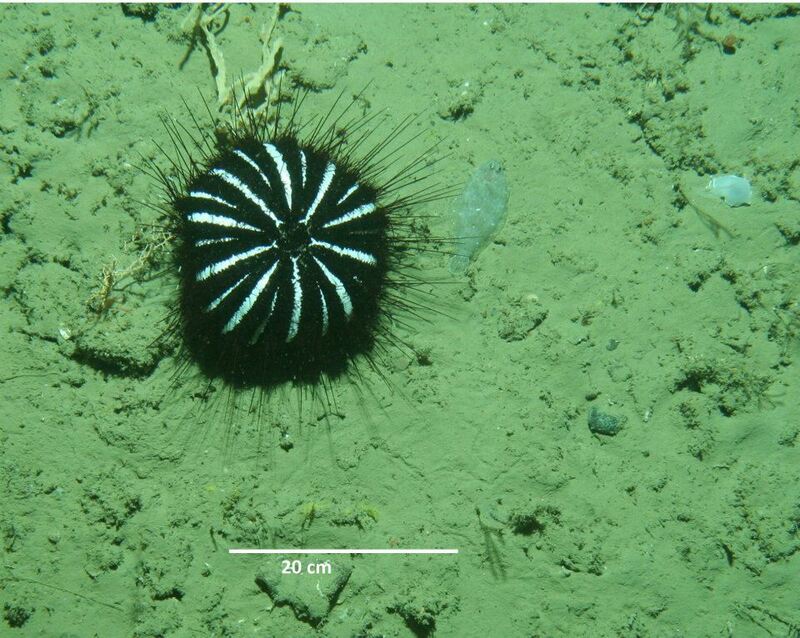 from Deep-Sea New Zealand! 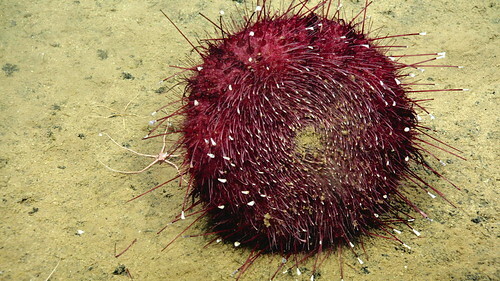 In February of this year, my friends at the New Zealand Institute of Water and Atmosphere (namely Owen Anderson) published a new paper describing not one but SEVEN new species of deep-sea sea urchins! Here in the journal Zootaxa. The original NIWA press release is here. These urchins have been getting all sorts of keen press, including here in the N.Z. Herald and here in The Sun. And of here on New Zealand's Maori news..
and I thought.. EVERYONE needs to know more about these exciting urchins! 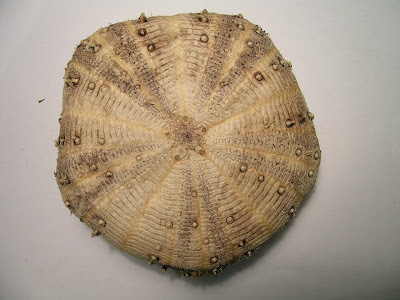 and so today is a bit of a "refresher" on echinothurioid sea urchins! 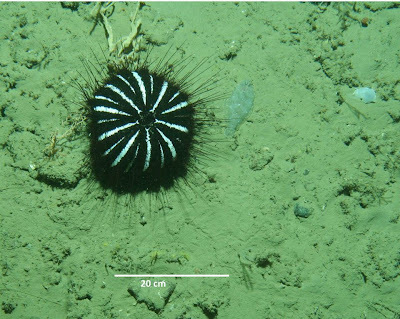 I wrote a short summary about these for Deep Sea News several years ago...(here) and wrote a short bit about the commensal relationships between these urchins and fish here. On this purple species from the Pacific (Tromikosoma maybe? 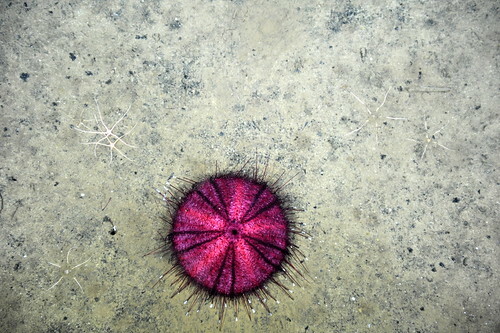 this isn't one of the new ones described by Anderson), you can see the white hoof-like spine tips that the urchins use to "walk" along the bottom.. 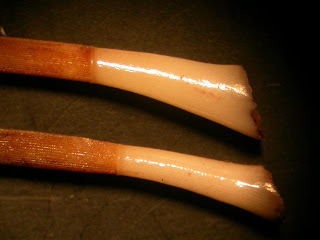 Here is a pic showing the oral surface (ie the bottom). 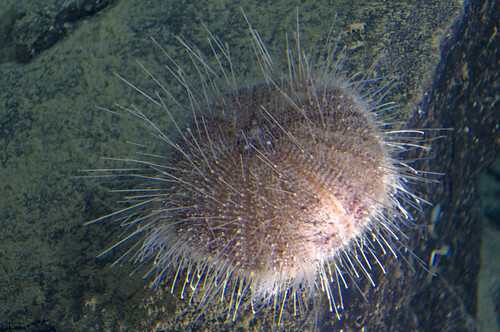 The mouth is at center and as you can see it is surrounded by spines with those white "hoof" like tips. These are what the animals use to "walk" along the bottom of the sea floor. Here's the spine close up showing the "walking tip"
Or sometimes like this Atlantic Phormosoma placenta which has the mysterious floating "bags" (containing spines). 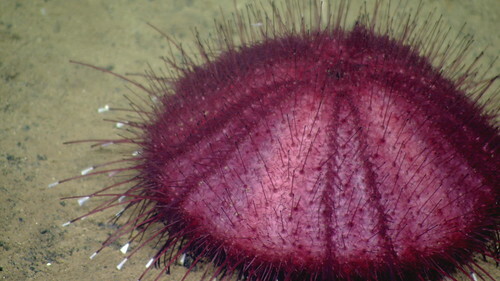 As a result of this "deflated" appearance, they are often called a variety of names: "pancake urchin", "leather urchin", "bag urchin", or "beret urchin." However in Anderson's new paper he feels a new common sobriquet would be most accurate-the Tam O Shanter urchin!!! 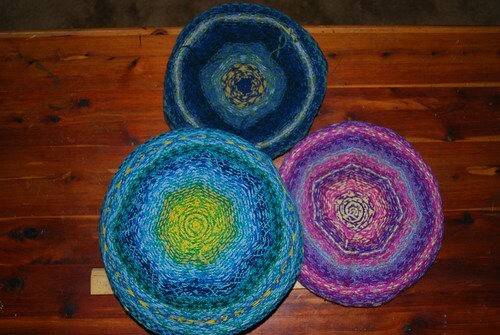 For those who are not as keen on Scottish headwear, a "Tam o Shanter" is a cap, sort of like a beret (wikipedia here) and you can sort of see the resemblance. 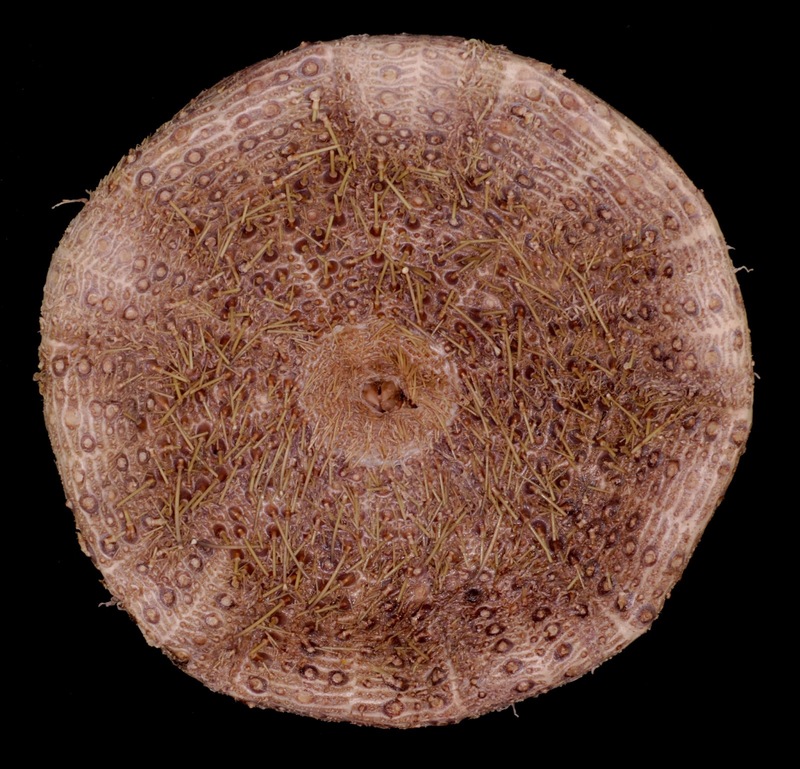 Owen's paper (here) describes a whopping SEVEN species in two genera. That's pretty significant given that MOST of these urchins were described in the early part of the 20th Century/late 19th. What other species will be found? Here's a brand new report about two new sea pens! Starfish Macro Shots! Up Close Tropical Edition!